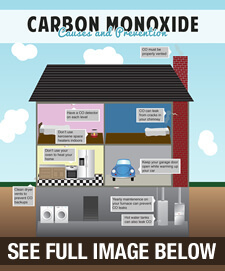 Carbon monoxide is a very dangerous gas that can be present in your home as a by-product of fuel-burning appliances. CO poisoning is a very real threat in any home. It comes from a number of sources, including faulty furnaces, kerosene heaters, wood-burning stoves or fireplaces, or gas-fueled space heaters. Why Is CO So Dangerous? You can’t see, taste or smell CO, but at high levels it will kill a person in minutes. You may not know you are being poisoned until it is too late! At moderate levels of contact with CO you and your family may experience severe headaches, become dizzy, faint, nauseated or confused. More severe symptoms include vomiting, loss of muscular coordination, and loss of consciousness. What Should You Do If You Think You’ve Been Poisoned? GET FRESH AIR IMMEDIATELY! Also, get to a medical center as soon as possible, and tell a doctor about your symptoms. How Can You Prevent CO Poisoning? Make sure you have your fuel burning furnace checked at the beginning of EVERY heating season by one of our trained professionals here at Logan Services. Also, it’s a good idea to make sure your flues and chimney pipes are connected, in good working condition, and are not blocked. Finally, carbon monoxide detectors should be placed on every level of your home, and the batteries should be checked and replaced annually to ensure proper operation. To learn more, check out our infographic below! Time to replace the old, unreliable furnace? Schedule a free in-home estimate today!